India Geography - HISTORY'S HISTORIESYou are history. We are the future. What are the names of the two rivers where Indian civilization began? Four ﻿civilizations﻿ of the ancient world began along the banks of great rivers. The world's first civilization, Mesopotamia, developed along the banks of the Tigris and Euphrates Rivers, where Iraq is today. In Africa, Egypt was born along the banks of the Nile. In China, civilization began alongside the Huang He River. The fourth of the ancient River Valley Civilizations began along the Indus River in South Asia. While building a railroad in northwest India during the 1840s, the British began to hear stories about ancient cities near their construction sites. Archaeologists, however, did not begin exploring those sites for another 80 years. When they did begin digging in the area, what they discovered was evidence of a well-formed, quite sophisticated ancient Indian civilization. Although the British had heard stories of ancient cities as early as 1842, the first excavations of Harappan cities did not begin for another 80 years. In the 1990's, satellite pictures revealed to scientists yet more information about the early settlers of ancient India. Those images showed an ancient, dried riverbed located in India's present-day Thar Desert. Geologists have identified this riverbed as the route of the ancient Saraswati River. The Saraswati lay east of the Indus River and generally followed the same course, originating in the Himalaya mountains and emptying into the Arabian Sea. Geologists believe that the Saraswati River dried up around 1900 BCE (Before the Common Era). Over time, the once fertile area around the Saraswati evolved into the dry, hot desert that exists today. Why did the ancient Indians settle along the banks of the Indus and Saraswati rivers? Above, a google earth image showing the Indus and Saraswati Rivers and the spread of Harappan civilization. Early Indian agricultural settlements arose in the Indus-Saraswati river region at least as far back as 6500 BCE. Like many other ancient peoples, the early Indians settled by rivers. They settled primarily on the banks of the Indus and Saraswati Rivers. These rivers provided the ancient Indians with plenty of water and, due to the deposit of rich minerals on the land during occasional flooding, the soil near the rivers was fertile and excellent for growing crops. The rivers also provided the Indians with a convenient way to travel and trade among themselves and with other civilizations. Archeologists have found artifacts such as carved seals from the Indus-Saraswati civilization in Mesopotamia's Sumer. These discoveries have led scholars to believe that the early Indians traded with Mesopotamia, possibly by traveling in ships down the Indus and Saraswati Rivers to the Arabian Sea and then west to Sumer and other locations. CLICK above to view a short video introduction to Harappan culture. The early Indian civilization that rose up along the banks of the Indus and Saraswati Rivers in South Asia is known by several names. Alternatively, you will hear it referred to as the Harappan Civilization and the Indus River Civilization. India is a part of South Asia, and South Asia is often referred to as the Indian Subcontinent. A sub-continent is a large land mass - like a continent, but smaller. South Asia is an area that is occupied today by India, Afghanistan, Pakistan, Nepal, Bhutan, Bangladesh and Sri Lanka. The entire region has many diverse physical characteristics offering a geographical variety that consists of deserts and swamplands, forests and grasslands, and mountains and coastal areas. Physical features such as these are often referred to as natural barriers. Natural barriers can greatly influence the way that people live and the type of society they create. Geography is the study of how people interact with their environment. People settle down in places where the landscape gives them resources necessary for their survival. With its great diversity of geographic features, this is especially true on the Indian Subcontinent. The Hindu Kush (left) and the Himalayas (right) formed when the Indian subcontinent collided with Asia 8 million years ago. These mountains and others that resulted from the collision stretch across India's northern border. This mountain zone isolates India from Asia and acts as a buffer against the cold winds that blow down from The Tibetan Plateau. The mountains also cause the monsoon winds and rain that arrive in the summer to stall over northern India, thereby creating an environment that is suitable for farming. 5 Regions: From ancient to modern times, India has played an important role in human history. Measured in land mass, India is the seventh largest country in the world. Close behind China, India has the second largest population. Just as in ancient times, India's geography continues to play an important role in its development. Before reading further, watch the short video at right. 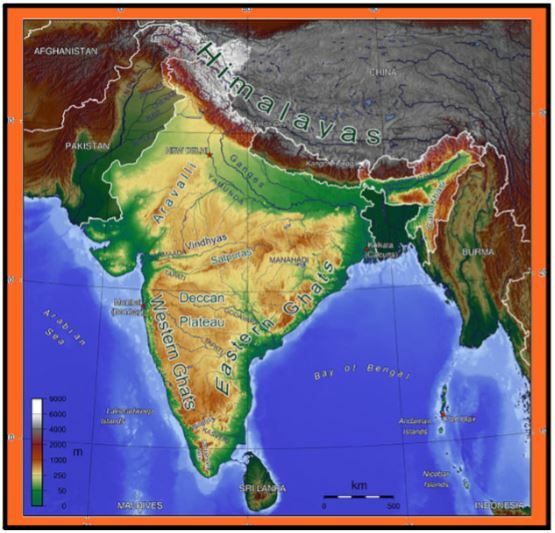 It is a good introduction to the geography of the Indian subcontinent and will give you a bit more detail about the places you will map in this lesson's activity. India is divided into five geographic regions: The Great Mountains, the Northern Plain, the Indian Desert, the Deccan Plateau and the Coastal Plains. As you read, pay special attention to words that help you identify where those geographic regions are located on your map. Do the same as you try to map places within those regions. Identifying, directional words include north, south, east, and west, as well as right, left, above, and below. How do the mountains in India's north benefit the Indian people? The Great Mountains: 8 million years ago, the Indian subcontinent collided with the Asian mainland. As a result of the impact, great mountains arose along the northern boundary of India. The northern boundary’s mountain zone stretches from Kashmir in the west to Assam in the east and separates the Indian subcontinent from the rest of Asia. It is also home to some of the world’s most spectacular mountain ranges. From west to east, or left to right on a map, those ranges include the Hindu Kush, the Karakoram, the Himalayas, and the Naga Hills. The world's 40 highest mountains are in the ranges that make up India’s northern boundary. Those high peaks include Mount Everest, K2, Nanda Devi and Kunchenjunga. These mountains form a natural barrier that provides only limited routes for travel between lands to the north and the subcontinent. The Himalayas are a tremendous physical and climatic barrier. During the winter months, they prevent the cold, dry winds from the Tibetan Plateau from crossing into India. When monsoon winds and rain blow in from the sea during the summer months, those winds and rain stall when they encounter the mountains. Because of that, the mountains keep India much warmer and wetter than if there were no mountains present at all. Additionally, these mountains are the source of the great river systems that flow through India’s north. Those rivers include the Indus, the Ganges, and the Brahmaputra. As a result, it is water from the Himalayan snowfields that provides the majority of India's water resources, as well as irrigation throughout the year. What are the names of India's 3 most important rivers flowing through the Indo-Gangetic Plain? Warm monsoon winds (shown in the map on the left) pull in moisture from the Indian Ocean and stall as they bump into India's northern mountains. Due to the monsoons the Northern Plain (shown in blue on the map on the right) exists as a humid, sub-tropical zone. The combination of seasonal flooding and monsoon driven rain makes this area one of the most fertile farming zones in the world. The Northern Plain: The Indo-Gangetic Plain is south of the Himalayas. It is formed by the basin of India’s great rivers - the Indus, the Ganges, and Brahmaputra. The Indus flows out of modern-day Pakistan and heads west, draining into the Arabian Sea. India's most holy river, the Ganges, is lined with temples. It flows out of the western Himalayas and heads east through India before crossing Bangladesh and emptying into the Bay of Bengal. The Brahmaputra begins its journey to the Bay of Bengal in Tibet, on the northern slopes of the Himalayas. From its origin, it flows across southern Tibet, crosses India, and flows through Bangladesh where it links with other tributaries to join the Ganges River before emptying into the Bay of Bengal. Because these rivers flood each year and deposit nutrient-rich silt on the soil, the Northern Plain is one of the most fertile areas on earth and is almost completely cleared for farming. It is also one of the most densely populated regions in the world. The present capital of India, New Delhi, is located on the Northern Plain. The Indian Desert: The Thar Desert, also sometimes referred to as the Great Indian Desert, lies southwest of the Indo-Gangetic Plain. It runs roughly parallel to the Indus Valley to its west and spreads from the southern edge of the Indian state of Punjab through northwestern Rajasthan, India’s largest state. This desert averages just 6 inches of rain a year - or less. What role did the Monsoons play in the development of early Indian culture? The Deccan Plateau: The word "Deccan" is derived from an ancient Sanskrit word "daksina," meaning "south." A plateau is a highland that usually consists of relatively flat land. The two most common causes for plateau formation are ancient lava flows and erosion from glaciers. The Deccan plateau is an example of a plateau that was formed from volcanic lava flows. By contrast, the Issaquah plateau just east of Seattle is an example of a plateau carved by the movement of glaciers. Because it roughly follows the contours of the large triangular, southern peninsula of India, the "Deccan Plateau" is also sometimes called the Peninsular Plateau. Whatever you call it, it makes up India’s greatest land area. The Deccan Plateau rises over 300 feet in the north and is over 1000 feet high in the south, forming a tilted tableland of low rolling hills, great river valleys and uplands. In the Plateau's central area, the rich black soil retains water. In the regions without this dark soil, however, lack of water is a constant problem. Much of India's mineral wealth is found on the plateau. The Deccan Plateau is surrounded by mountains on each of its three sides. Great granite rocks and plateaus formed from hardened lava beds cover much of the Plateau. Rocks found there are among the world's oldest, dating back over 600 million years. The hilly portion of the Deccan are covered with either sparse forest or short, scrubby vegetation. The ghats, more or less frame, the Deccan Peninsula with rolling hills. The Ghats: The coastal Western and Eastern Ghat mountain ranges (ghat means “hill”) form a V that nearly meet at the southern tip of the plateau. The Satpura and Vindhya ranges form its northern border. These Ghats (hills) rise abruptly on either side of the Deccan Plateau and, more or less, frame the Peninsula. The Ghats are a barrier to transportation and rainfall. The narrow coastal plains bordering the Arabian Sea and the Bay of Bengal lie beyond the Ghats. The Coastal Plains: The Western Coastal Plain is much narrower than the Eastern Coastal plain and much wetter.